For the first 105 minutes, the 2006 MLS Cup was not the most entertaining game. The game was scoreless and neither team had a multitude of quality scoring chances. Taylor Twellman had a nice header that Pat Onstad saved at about the 26 minute mark. Other than that chance, the closest call perhaps was when Shalrie Joseph was taken down in the Houston penalty area by Adrian Serioux. Referee Jair Marrufo allowed play to continue on and television replays made it look like Joseph took a dive on the play. In the second overtime period, Taylor Twellman scored the first goal in an MLS CUP match in New England Revolution history. In the 113th minute, second half sub Khano Smith found Twellman on the left side of the Houston penalty area and Twellman had a perfect shot just inside the far post to put the Revolution ahead. The Revolution went nuts after the goal and perhaps they celebrated a tad too much as less than a minute later, Brian Ching would level the match at one goal apiece. Brian Mullan swung a cross into the box and Ching rose up and just drilled a header past Matt Reis. After the equalizer, penalties were pretty much a foregone conclusion. In the opening round of penalties, Kelly Gray converted for Houston and Shalrie Joseph finished for New England. In the second round, Stuart Holden scored for the Dynamo and goalkeeper Matt Reis converted for the Revolution. In the third round, 2006 MLS MVP finalist Dwayne De Rosario converted for Houston and Pat Noonan missed just over the top of the crossbar for New England. In the fourth round, Matt Reis saved Brad Davis' penalty for Houston and Taylor Twellman converted to even things up. In the fifth round, Brian Ching converted for Houston and Jay Heaps had his attempt to Pat Onstad's right stopped cold. And the celebration by the orange clad Dynamo team and fan base was on. The most popular question after all was said and done was why was Jay Heaps taking that crucial penalty? Clint Dempsey was the name on the lips of most as to who should have been taking that PK. And as long as his ankle was willing, I can't argue with that one. 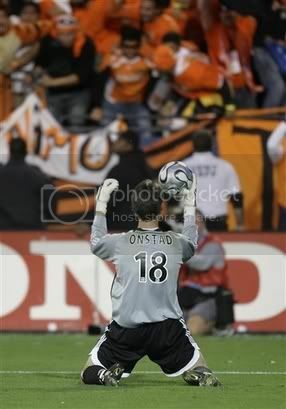 But, I couldn't be happier for Pat Onstad who became only the second goalkeeper in MLS history to start and win an MLS Cup. Gabrielle Marcotti has a very interesting piece in today's London Times about the upcoming training session/trial for Freddy Adu with Manchester United. Personally, I don't think that Adu is ready to play for Manchester United. However, I could easily see Manchester United investing in the Adu brand and then either loan him back to MLS for another year or loan him to another team in Europe while he gets some seasoning. Hopefully it works out for everyone involved. But, I just hope that Adu doesn't try and make too big of a jump too soon. The big news of the weekend was the "Beckham Rule" is officially being named the Designated Player rule and looks to be a done deal moving forward. But there was a ton of other big things that came out in the address from the Mexico-MLS Champions League type competition that will start next year to MLS allowing teams to sign players from their own academies without potentially losing them in the draft to Rochester once again being brought up again as a potential expansion site. There will be plenty of time during the off season to discuss the potential impact of the Designated Player rule. But my quick take is that they have to be really, really careful who they spend big money on. And at the end of the day, my guess is that a guy like Beckham will likely only have a Freddy Adu type of effect on the league as a whole. And I don't really see that being worth the money that MLS will likely have to spend.